Corridors and multiple floor maps | La Noia Di Muu? I’m still working on this map generator, a project absolutely bigger than my programming knowledge, but I’m actuallly enjoying it. 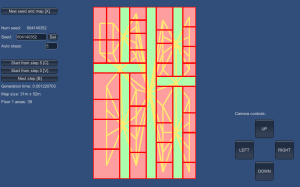 It now features different level shapes, multiple floor generation and corridors (printed in green in the demo). I didn’t add a way to explore different floor, so only the topmost one will be shown. As you can see in most maps the corridors are pretty lame. It needs some more features, like stairs connecting the floors and a better corridor placement script. You can find the new version here.